Prime Minister Sheikh Hasina on Saturday asked the authorities concerned to take steps so that drivers cannot engage in ‘evil race’ on highways and roads as those often cause fatal accidents. “You (authorities concerned) have to look into evil races by drivers on highways and roads and check those,” she said. The Prime Minister ordered this while inaugurating the four-lane second Kanchpur Bridge on the Shitalakkhya River, four-lane flyover at Bhulta and a railway overpass at Latifpur on Dhaka-Sylhet Highway through videoconferencing from her official residence Ganobhaban. Hasina said modern technologies, including cameras and speed-guns, have to be installed to prevent drivers from engraining in racing. In the past, she said, these issues were not addressed properly, but now those are being dealt with properly. Mentioning that drivers are being held responsible initially for any type of accident, the Prime Minister said there should also be enquiries to find out the faults of victims. The Prime Minister also put emphasis on allowing drivers to take enough rest and providing food to them in due time. She asked bus drivers to always think that they are not alone in the buses as there are many passengers with them. 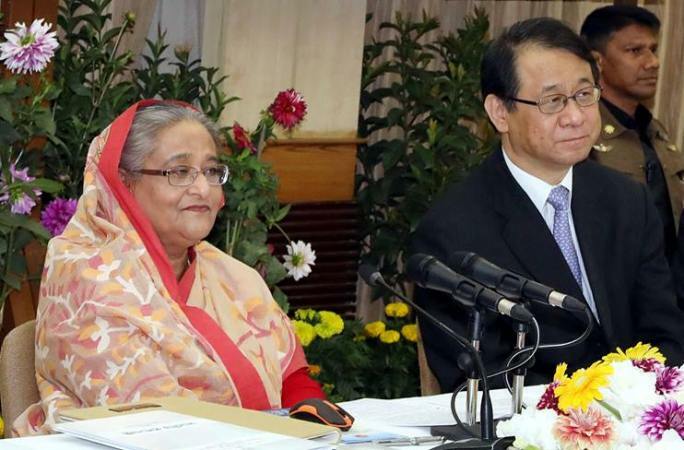 Hasina asked the authorities concerned to be strict on allowing overweight trucks for plying bridges. “There should be weighing machine at every bridge point…the weight management should strictly be maintained…. otherwise the bridges won’t last longer,” she said. Briefly describing various development activities of the government for developing the communications system of the country, the Prime Minister said the government is very much sincere about the balanced development across the country. Later, she talked with a cross-section people of Narayanganj, Rupganj and Gazipur.